Simon & Schuster, 9781476794242, 288pp. A “brilliantly done” (Sunday Times, London) comedy of manners that explores the unease behind the manicured lawns of suburban America from the Orange Prize–winning author of A Crime in the Neighborhood. Littlefield, Massachusetts, named one of the Ten Best Places to Live in America, full of psychologists and college professors, is proud of its fine schools, its girls’ soccer teams, its leafy streets, and charming village center. Yet no sooner has sociologist Dr. Clarice Watkins arrived to study the elements of “good quality of life” than someone begins poisoning the town’s dogs. Are the poisonings in protest to an off-leash proposal for Baldwin Park—the subject of much town debate—or the sign of a far deeper disorder? Certainly these types of things don’t happen in Littlefield. With an element of suspense, satirical social commentary, and in-depth character portraits, Suzanne Berne’s nuanced novel reveals the discontent concealed behind the manicured lawns and picket fences of darkest suburbia. 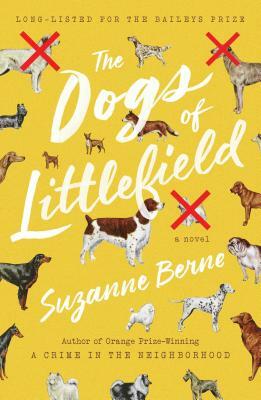 The Dogs of Littlefield is “a compelling, poignant yet unsentimental novel that examines life, love, and loss” (Sunday Mirror, UK).